Anne Arlington is twenty-seven, single, and in demand: she is the independent “college whisperer” whose name is passed from parent to parent like a winning lottery ticket, the only tutor who can make a difference with the Ivy League. Early Decision follows one application season and the five students Anne guides to their fates: Hunter, the athletic boy who never quite hits his potential, a kind, heavily defended kid who drives his mother mad; Sadie, an heiress who is perfectly controlled but at the expense of her own heart; William, whose intelligence permits him to dodge his father’s cruel conservatism but can’t solve the problem of loneliness; Alexis, a blazing overachiever whose Midwestern parents have never heard of a tiger mom; and Cristina, who could write her ticket out of her enormous, failing high school, if only she knew how. Meanwhile, Anne needs a little coaching herself, having learned that even the best college does not teach a person how to make a life. 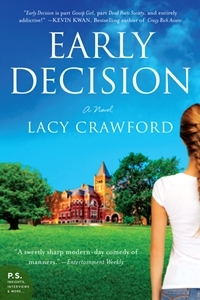 In this engrossing, intelligent novel, Lacy Crawford delivers an explosive insider’s guide to the secrets of college admissions at the highest levels. It’s also a deft commentary on modern parenting and how the scramble for Harvard is shaping a generation. Told in part through the students’ essays, this unique and witty book is so closely observed that it has been mistaken for a memoir or a how-to guide. A wise and deeply felt story, Early Decision reveals how getting in is getting in the way of growing up. For fifteen years Lacy Crawford served as a highly discreet independent college admissions counselor to the children of powerful clients in cities such as New York, Chicago, Denver, San Francisco, Los Angeles, and London. Her “day jobs” included serving as senior editor of Narrative magazine and director of the Burberry Foundation. Educated at Princeton and the University of Chicago, Crawford lives in California with her husband and two children. 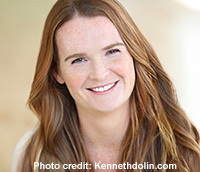 Connect with Lacy Crawford through her website or Twitter.